Follow one little cat’s journey on his search for family, home and love. Boots the cat will show you the way to the divine mysteries of life, help examine the transition to our next life and assist your understanding of the experience of higher dimensions that await us all. This is a short story that will make you cry and swell your heart. It is for anyone who has lost a loved one and yearns to know where they have gone. The Healing–One Small Cat’s Divine Mission is based on a true touching tale that explores transition and loss, and many metaphysical principles. This tale examines and teaches several levels of understanding of the cycles of life, and the joy and wisdom in simply living, and belief in the universal Spirit and miracles of God’s healing love. 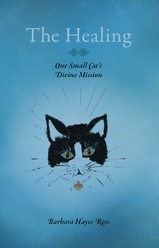 A book designated “for children of all ages,” The Healing–One Small Cat’s Divine Mission is a must read for those who are young at heart and willing to expand their vision of themselves and their life on all its levels. When you order through this website will you get a copy autographed by Reverend Barb. The Healing makes a great gift for those who have lost a family member or loved one, and for spiritual seekers and animal lovers everywhere. Listen to a sample of The Healing, One Small Cat's Divine Mission. "This book is filled cover to cover with love, inspiration and hope. It's a perfect blend of ageless wisdom and timeless love to captivate the heart of children of all ages. Reading it will put a smile in your heart." "Dear Reverend Barb, I have just read your beautiful book, The Healing - One Small Cat's Divine Mission. I want to thank you for all the help you have been to me on my personal spiritual mission through the last several years. You keep me on track when I loose the way. The book is a great tribute to your journey to help those reaching out by telling your story. Thank you for letting the world know your soul through this wonderful little book. Miracles do come in small packages some time!"